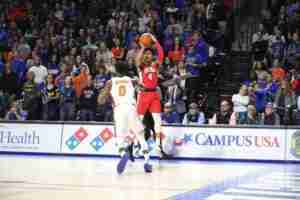 GAINESVILLE, Fla. – The Ole Miss men’s basketball team (14-6, 4-3 SEC) fell to the Florida Gators Wednesday night in Gainesville, losing a heartbreaker in overtime, 90-86. 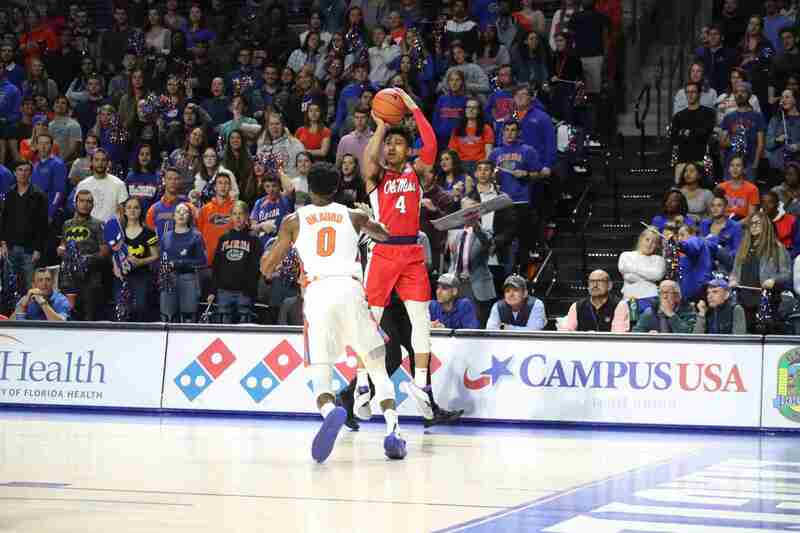 The evenly-matched contest featured a total of nine ties and seventeen lead changes between the Gators and Rebels throughout the 40 minutes of regulation. In the first half, neither squad consistently knocked down shots from the field, with Ole Miss shooting 38% in the first 20 minutes. Similarly, Florida could not force a large lead on the Rebels, as head coach Mike White’s team shot 43% in the same stretch of time. The teams entered halftime with only three points separating the two– a 33-30 Florida advantage. The Gators jumped out early in the second half, taking a seven-point lead in the first five minutes. But Ole Miss’ shots started to fall and the Rebs found themselves holding a lead off an 11-0 run courtesy of Terence Davis and Breein Tyree. Florida battled back to close the gap and take a 71-70 lead off a Noah Locke three-pointer with 1:56 to play. Ole Miss kept fighting, however, and coming out of a Rebels’ timeout, Terence Davis hit a clutch basket that gave Ole Miss a 72-71 lead. The Gators then fouled K.J. Buffen and the freshman Rebel sank both free throws to give the Rebs a 74-71 lead with a minute to go in regulation. 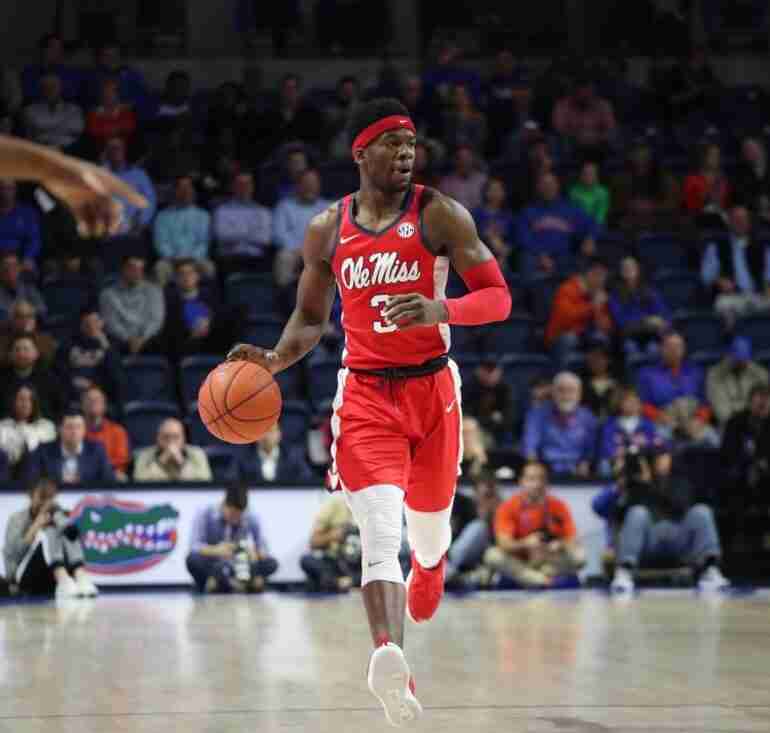 Following a bucket by Florida that cut the Ole Miss lead to 74-73, Breein Tyree hit two free throws to give the Rebels a three-point lead, 76-73, with eight seconds left in the game. But after a Gators’ time out, senior guard KeVaughn Allen hit a three-pointer with 2.7 seconds remaining to send the game into overtime, tied at 76-76. The Gators got off to a hot start in overtime, going up on the Rebels by seven, 86-79. Buffen, Tyree, and Davis gave their best efforts to close the gap in the final seconds; however, the Gators ultimately emerged victorious, 90-86. Terence Davis led all players with 26 points, while Tyree notched 20 and Buffen added 17. Noah Locke led the Gators (12-8, 4-3 SEC) with 22 points. Statistically speaking, rebounds, second-chance points, points in the paint, and free throws all went in favor of the Ole Miss squad. Florida out-shot the Rebels from downtown, hitting 11-26 (42%), while Ole Miss tallied 6-23 (26%) from long range. Ole Miss played its first overtime game of the season. The duo of Terence Davis and Breein Tyree combined for 46 of the team’s 86 points. With his first bucket of the game, Terence Davis passed Cob Jarvis (1,313 points) to move to 18th on the Ole Miss all-time scoring list; Davis scored 26 points, the 21st 20-point game of his career (ninth this season) and now has 1,338 career points. Breein Tyree produced his 10th 20-point game of the season. Terence Davis recorded his third double-double of the season, all in SEC play, and the ninth of his career (26 points, 12 rebounds). Terence Davis tied his career-high free in throws (8 of 10, all in first half). KJ Buffen scored a career-high 17 points. KJ Buffen entered the game as a 61.7 percent free throw shooter and went 8 for 8 at the line, all in the second half. The Rebels will return to the hardwood in Oxford on Saturday to take on in-state rival Mississippi State. The game is scheduled to tip off at 2:30 p.m. (CT) and will be televised on the SEC Network. The No. 21 Bulldogs (15-5, 3-4 SEC) enter the game with Ole Miss following a tough loss to the Alabama Crimson Tide, 83-79.